What will it take to fix the broken reimbursement system? Align physician reimbursement to compensate for the best possible patient care coordination. Democrats and Republicans don't often agree on how to fix U.S. health care. As evidenced by the 2008 election, the parties disagree on the merits of government-guaranteed insurance versus creating incentives in the market and over whether it is better to plug gaps in the employer-sponsored system or give people tax credits to buy individual insurance. One issue where they do agree, though, is on the need to fix a dysfunctional physician payment system. Senators John McCain and Barack Obama proposed strikingly similar ideas for fixing physician payments. Create incentives for prevention instead of just for treating illnesses after they occur. Pay doctors in part on how well they do in achieving measurable improvements in quality. Organize payment around a patient-centered medical home. Compensate physicians for care coordination not just volume of services. A looming 21% physician pay cut on Jan. 1, 2010 will focus Congress' attention on the need to pass a major Medicare pay reform bill in 2009. Many lawmakers understand that Congress can't just repeat its standard practice of enacting a stop-gap measure to halt the immediate cut paid for by deeper cuts later on. The apparent consensus on the need to reform the system masks the difficulties involved. As dysfunctional as the current system appears to be, many physicians, manufacturers and even patient advocates will have a vested interest in opposing reform. The main problem with the current Medicare payment system is that compensation is based on volume of procedures. As a result, physician specialists who bill more procedures generally have higher Medicare revenue—and incomes—then those (like primary care physicians) who do not. Physicians who order fewer procedures while achieving the same or better outcomes are paid less than colleagues who order more procedures but have comparable or worse outcomes. Physicians in areas of the country with lower volume earn less than those who practice in high volume areas, even though the evidence suggests that quality may be superior in the lower volume communities. If paying for volume is the problem, then the solution seems evident: pay doctors for quality, efficiency, care coordination and prevention instead of how many procedures they perform. Who would be against that? Start with the physicians whose incomes are based on billing for procedures. Add in the manufacturers of advanced medical technologies. If doctors are no longer paid based on volume, they are less likely to buy their equipment because they can no longer be guaranteed that they will make up their initial sizable investment with volume. Payment reform also may split physicians and members of Congress according to where they live. Doctors and lawmakers in high volume geographic areas are not likely to take well to payment reforms that redistribute monies to lower volume areas. Even those primary care physicians who might be expected to benefit from payment reform may not necessarily be on board. Proposals to increase payment for primary care usually include a catch: primary care physicians would be able to earn more for prevention and care coordination, but they also would be accountable for reporting on the quality and efficiency of care that results. 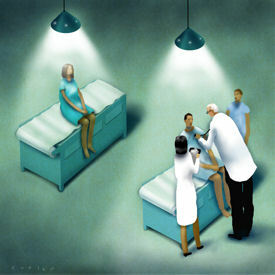 Many primary care physicians just want to be paid more for what they are already doing and then be left alone. And if primary care doctors are paid more, where will the money come from—other physicians? Then there are the all-important details: how exactly will Medicare shift from paying for volume to paying for prevention and care coordination and who will control the dollars? How will prevention and care coordination be defined and documented? If payment is based on measurable outcomes, who determines the measures and what are acceptable outcomes? The list of questions goes on and on. Such questions are too important to leave to the politicians and policy wonks to decide, which is why ACP is developing its own framework for a better physician payment system. Such a system should reward care coordination, prevention and evidence-based medicine. It should result in higher payments to general internists and other primary care physicians. It should begin to un-tether volume from compensation while recognizing the risks of under-treatment and avoidance of high-cost patients that may result. At the same time, any new payment system must be fair to those who have benefited from the current system and give them and their patients a way to do well under the new payment structure. Most importantly, a better physician payment system should result in a better patient care system, by aligning physicians' compensation with encouraging the best possible care of patients. Getting from here to there won't be easy, but the alternative is a status quo that does not serve the interests of either patients or their physicians.